Founded in 1955, Shemin initiated 'one-stop' horticultural distribution centers in the United States, providing fresh nursery stock to landscape contractors and not to the retail public. 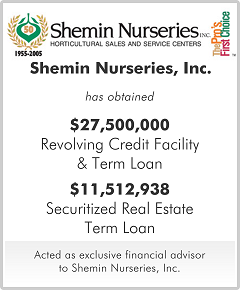 At the time of this financing, Shemin remained the largest wholesale distributor with approximately $70 million of revenue. Given Shemin's seasonal requirements, the revolving credit facility was structured with advance rates that were higher during peak requirements. As Shemin had many immediate growth opportunities, long-term patient capital was required to facilitate. The securitized real estate term loan was selected due to its 20-year, fully amortizing structure with minimal financial covenants. This financing was used to facilitate a buyout of the company from the Weyerhauser Corporation.